The Gipper is Obama's 'role model,' writes EJ Dionne Jr.
(Newser) – President Obama is following in the footsteps not of a liberal giant, but of a conservative one: His "role model is Ronald Reagan," writes EJ Dionne Jr. in the Washington Post. Obama himself admitted as much during his 2008 campaign, when he said that "Ronald Reagan changed the trajectory of America in a way that Richard Nixon did not and in a way that Bill Clinton did not." Like Reagan, Obama is pushing for a "long-term electoral realignment," but he's going left instead of right. Ronald Reagan said:"People are poor by choice".He went to Bitdburg Germany, to pay hommage to dead nazis.He launched his campaign from Philadelphia Mississipi, where some civil rights workers were assassinated.He promoted a climate of greed and selfisness during his presidency.How can you compare Obama with that monster? 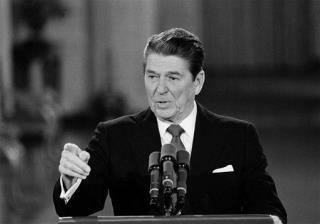 The nearer Reagan got to Alzheimer's Disease, the more the conservatives identified with him. Obama is to Reagan as Mickey Mouse is to Superman.